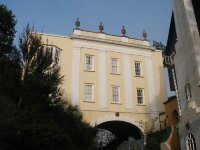 Improvements to several areas of Portmeirion continue apace with the recent news that the interior of Bridge House (left) has been refurbished. The building houses 4 seperate suites which can be booked on a nightly basis. To have a closer look at the refurbishment, click HERE. With thanks to Mark Goodacre for this news item. Photo (c) Rick Davy.